"Mrs. Smith, you have breast cancer." Those aren't words I thought I'd ever hear in my lifetime. Immediately, I called my husband at the office, knowing I could be vulnerable with him, and that his strength would enhance my own. But my brain would not cooperate with my mouth to utter those four irrevocable words. "I have breast cancer." When the words were finally spoken, the tears began to flow. "How do I tell my boys?" I began to really cry. Sob. Weep. Not because of my diagnosis, per se, but because the thought of possibly not being around for my babies -- my then three teenage sons -- was heart-wrenching. Isn't it something how we moms think? Immediately, I went into "Momma Bear mode" wanting to protect them. "What will happen to my boys if I'm not around?" I held back the tears for now. "I have to be strong for them, " I told myself. I knew I didn't want to tell them until after we had established a clear plan: finding an in-network breast surgeon, plastic surgeon, hospital, and securing a surgery date and treatment plan. It was 2014, and our boys were age 13, 16, and 19. Our 19-year-old was away at college, so once we had a plan, we decided that we'd tell the boys when they were all at home at the same time -- but separately because of their age differences. That way, no one would feel awkward about their natural reaction -- whether it was sadness, anger, or just plain questions. Because life happens when it wants to, I had to hold on to this God-forsaken revelation for what seemed like an eternity. The news came in the midst of two of their back-to-back birthdays, and there's no way I would ruin those! I waited until after Thanksgiving and then mid-terms to end for my then-college sophomore. All the while, my husband and I are running up and down Interstate 95 from NYC to NJ, doctor to doctor, having God knows how many tests... and keeping it a secret from them ALL. The day finally came. All of their reactions were completely different. I decided to tell my 17-year-old while joining him on a walk with our three dogs. "I have something to tell you," I said. "I have breast cancer," I said in my best matter-of-fact voice. "Wait. What? How long have you known this?" "A few weeks," I said. "...We didn't want to tell you until we had a plan." His reaction? "So, what now?" I explained to him that I opted to have a double mastectomy and may need chemotherapy after that. Other than his shock that I, his mother, could actually get cancer -- he really had few words. He asked when the surgery date was and proceeded to pick up the poop. My 13-year-old is a funny guy. Ironically enough, the weekend after my biopsy, he shared with me that one of his classmates' moms had breast cancer. He was sure she was dying. I assured him that she was not -- but what a great segue for me! I told him. "Remember when you told me about your classmate's mom having breast cancer?" "Yes," he answered. 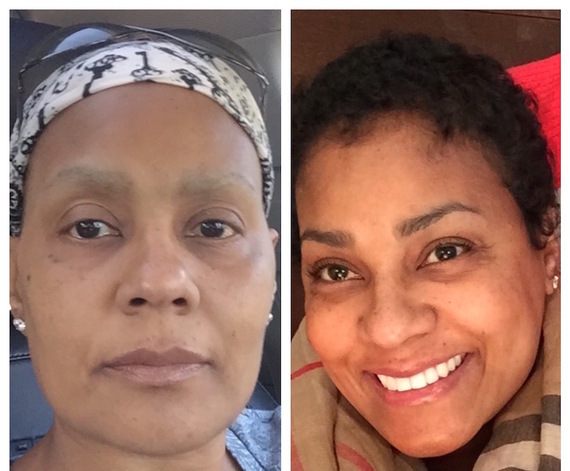 "I have breast cancer, too," I said, "and I'm going to be fine." going to heal me. I'm not worried and neither should you be." "Who's gonna drive me to basketball practice and make my lunch?" he asked. At that moment, I knew he was okay. Mission accomplished. My oldest son has always been a deep thinker. I knew this would not be a short conversation. I sat him down alone in my home office and told him the news. He was shocked. I think he asked me more questions than I initially asked my oncologist! He was concerned about his brothers -- how they took the news. I assured him that they were ok, and so was I.
Phew. They all now knew. And not one tear! My husband and I then gathered the boys together in the family room to further discuss details of "mom's breast cancer diagnosis." By that time, the boys had all conferred with one another. This, for me, was an unspoken way to let "it" out in the open and allow them to feel like it wasn't anything shameful, secretive, or a topic that they couldn't discuss. They'd had some time to think about it by now, and they could ask any questions or make any comments that they wanted. Each was able to see how the other was dealing with it so that they didn't feel as if they were alone in their feelings. This was going to be a journey we were taking as a family. I wanted them to know that they could lean on each other as much as they could lean on their dad and me. Still not a single tear shed. Not even from me. They listened to my voice and were surprised at my strength. I surprised myself. I wasn't sad. I wasn't worried. I was confident that God was going to get all of us through this, and they believed me... and He did.